Even though this is old news---like 20 years ago old news---it's still worth saying: as the ozone layer thins, sunscreen becomes soooooo much more important. When I was young I used to purposefully bake in the sun until I burned, but now I know better and have become a little sunscreen obsessed. If only I were that smart in my teens, I wouldn't have used the sun as my personal oven---on broil. Knowing the sun's rays can be hurtful with prolonged exposure, weather networks have began highlighting the UV index. This international, standard measurement of how strong the sun's ultraviolet (UV) radiation is at a particular place, on a particular day, ranges from 0 (no danger to the average person) to 11+ (extreme risk of harm from unprotected sun exposure). UV Apps Here are some apps that will tell you about the sun's fluctuating UV strength. Whether you use these apps at home or abroad, hopefully you'll use the indices to protect your skin versus bake sans sunscreen! UV Detector This useful app lets you monitor the UV index in your city, as well as view weekly forecasts, receive customized alerts when you should wear sunscreen, and share these alerts with your friends through email, facebook, twitter and more. Works for most major cities worldwide. The Weather Channel This app has all the bells and whistles of a regular weather app, as well as includes the UV index in its current forecast feature. 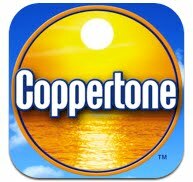 MyUVAlert™ Coppertone has developed an app aptly named MyUVAlert™ to help predict the level of sun protection needed. The only drawback? It's only available for US destinations, and Canadians can't download it.